When monkeys landed in South America 37 or more million years ago, the long-isolated continent already teemed with a menagerie of 30-foot snakes, giant armadillos and strange, hoofed mammals. 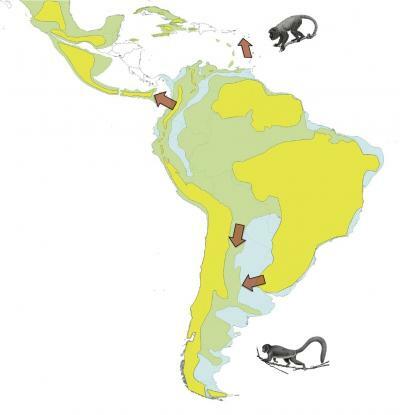 Over time, the monkeys forged their own niches across the New World, evolved new forms and spread as far north as the Caribbean and as far south as Patagonia. Duke University evolutionary anthropologist Richard Kay applied decades' worth of data on geology, ancient climates and evolutionary relationships to uncover several patterns in primate migration and evolution in the Americas. The analysis appears online this week in the journal Molecular Phylogenetics and Evolution. "We know from molecular studies that the monkeys have their closest relatives in Africa and Asia -- but that doesn't explain how they got to South America, just that they did," said Kay, a professor in the evolutionary anthropology department and division of earth and ocean sciences at Duke. About 11 million years passed between their arrival and the first fossil evidence of monkeys in the Americas, leaving the details of their early evolution an unknown 'ghost lineage.' 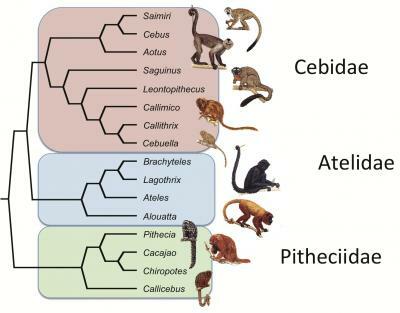 The humid, heavily forested environment of what is now the Amazon Basin has made both fossil formation and modern-day discovery difficult, but understanding what happened there is the key to New World monkey evolution. "The gold standard is molecular evidence," he said. By sequencing the DNA of living monkeys, scientists have come to a clear consensus of how the different species and genera are related. But genetic material deteriorates, so researchers studying extinct species must rely on a proxy: the minute differences in shape, size and structure in fossilized bones. "It's the only tool we have," said Kay, but "it does a pretty good job." This research was supported by National Science Foundation grants BNS-1042794 and BNS-0851272, as well as grants from the National Geographic Society and the Leakey Foundation.